The Office 365 Express Migration allows moving Office 365 mailboxes to another domain / account. It migrate contacts, emails, calendars, tasks & Shared mailbox from one Office 365 tenant to another Office 365 account. This software will maintain all Meta properties while converting data from source to destination. Also, it offers an option to pause the process and resume whenever required. 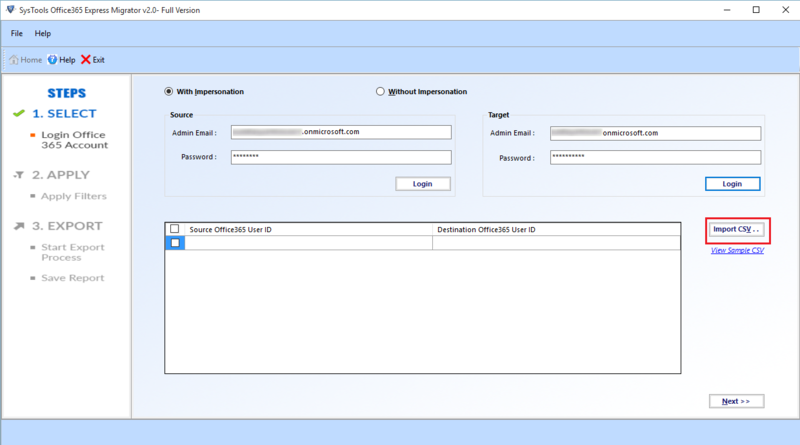 In order to begin the transfer, users have to provide the mailbox credential for source and destination. 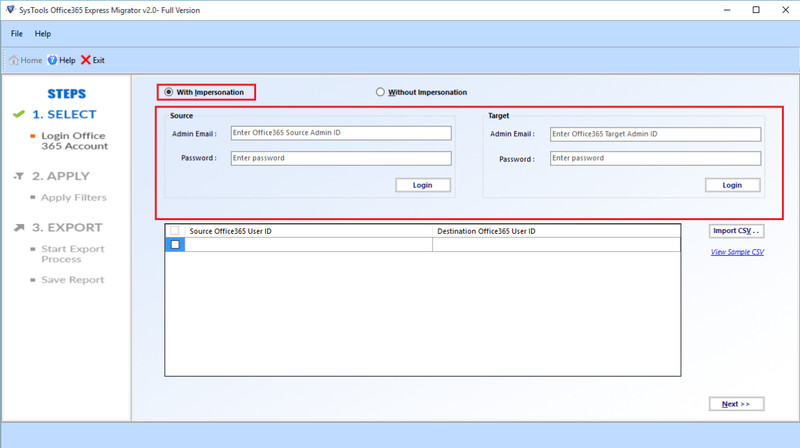 To do this, instead of adding them one at a time manually, users can add .csv file having each detail of Source ID, Source Password, Destination ID and destination password of Office 365 account. The sample CSV is embedded within the software for reference purpose. The Office 365 to Office 365 migration tool allows to move data from one MS Office 365 to another account and also help to filter the emails received within a certain date range. With this feature, users can export emails, calendars and tasks between "From" to "To" date range by setting up filters accordingly. It will become easy to convert Office 365 tenants to another account with selective range of date. Office 365 Express Migration utility equips an option to export emails, calendars, contacts, and tasks. However, if users want to move only selected items, then they can check or uncheck that item from the software pane. It can only migrate selected items, by preserving the complete folder hierarchy. This application allows the users to move folders by just entering the list of folders (as inbox, sent, etc). As you are adding the source and destination mailboxes, MS Office 365 to Office 365 Migration Software first maps each user mailbox. Once the mapping is done, it will authenticate mailboxes and proceed with data migration. You can also view the mailbox authentication process in progress status window after clicking on Export button. 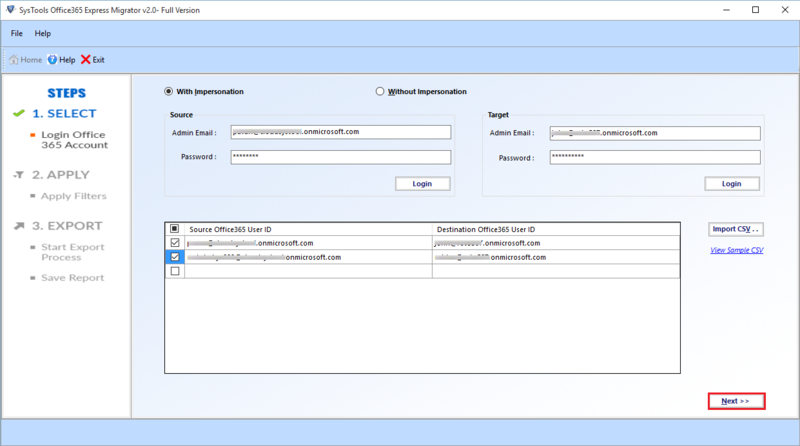 As you begin the Office 365 transfer; Office 365 tenant to Office 365 tenant migration tool will display the complete details and total count of mailboxes being exported from source to destination. Further, you can see both current or final status report which contains details such as name of mailbox, emails count, calendar count, tasks count, contacts count, and time consumed during migration process. Trial version of Office 365 to Office 365 Migration Software can transfer / move 100 mails and 25 other item categories such as Calendars, Contacts and Task of one Office 365 to other Office 365 account. Can I move multiple Office 365 tenants within a single domain using Office 365 Express Migration tool? Yes, this migration tool can easily transfer multiple Office 365 mailboxes within as well as across MS Office 365 domains. Is it possible that the folder hierarchy is maintained after using this migrator tool? Yes, even after using this software the structure of folders and meta property is not disturbed. Does the software allow to migrate data from one Office 365 to another account? Yes, this application is well organized to move domain from one Office 365 tenant to another tenant. Does Office 365 to Office 365 migration tool convert shared mailboxes from MS Office 365? Yes, with this software users can migrate Office 365 shared mailboxes to user mailbox or new tenant user mailbox. 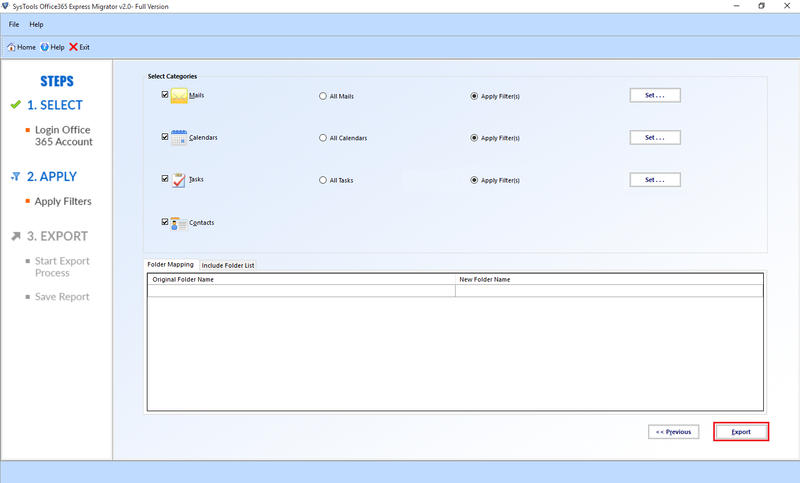 It allows to move shared calendar to another tenant. Does this migrator tool provide recurrence for Calendars and Tasks? Yes, Office 365 Express Migration tool supports to provide recurrence for tasks as well as calendars. Does this software provide an option to pause the transfer process whenever needed? Yes, this Office 365 to Office 365 Migration application equips an option to pause and resume the transfer process whenever necessary. With this software can I migrate Office 365 Mailbox to Office 365 in a different tenant? Yes, Tool will migrate mailbox from one Office 365 tenant to another Office 365 tenant. 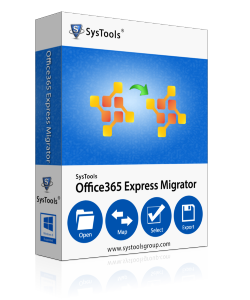 “I really appreciate the overall working of this Office 365 Express Migration tool. For the past few weeks, I was in the search of the application with the same features. Unfortunately, I could not get any such software. Then, while surfing through the internet, I came to know about this fantastic tool to export data from one Office 365 to another Office 365 domain. Great Utility!!"